The winter grading tests will take place over the coming weekend and details will be in the next article. For further information on the Kyokushinkai Karate club, contact Iain Rodger (6th dan) for a friendly chat on 07584 166542 or iain@ikku.co.uk. Alternatively, send a message to Caledonia Kyokushin on Facebook. Classes continue as normal on Wednesday evenings at 4.30pm for juniors and 6pm for seniors at the Old Crofters up above Stoddard’s motorbike shop. Telephone Wullie on 07480 273190, or email shihanwill@gmail.com or you can also find them on Facebook as Senshi Do Kickboxing. 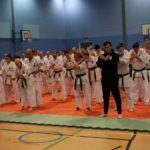 Students of Argyll Martial Arts/Argyll Shukokai held their winter grading and mini tournament recently. Grading results. 8th kyu: Emma MacCallum and Alfie McMullen. 7th kyu: Isaac Charlton, Max Allen and Abbie Frew. 6th kyu: Ellis Mckenna, Milly Mitchell, Callan Frew, Jack Wilson, Norma Jack, Tereza Konickova and Connor Blue. 5th kyu: Daniel May, Francesca Warnock, Callan Taylor, Matthew MacDougal and James MacCallum. 4th kyu: Harry Frew, Elaine Mitchel, Joshua Mitchel, Michael Caroll and Matthew Jamieson. 3rd kyu: Lucy Blue, Callan May and James Whitelaw. 2nd kyu: Feorlin Renton, Eloise Ginestiere, Douglas Cameron and Gregor Warnock. 1st kyu: Lewis May and Conan Burns. Anyone looking for more details on these clubs should contact Kenny Gray (5th dan) at kenni.gray@btinternet.com or on 07884 183905. Oban MMA had a busy month with two seminars taking place in the course of a few weeks. The first seminar was a jiu jitsu one with the club’s head BJJ instructor Marcos Nardini. The seminar covered the spider guard position going over sweeps and finishes from this position. At the end of the two hours, students who had shown improvement over the past year were given stripes on their belts. Drew MacCallum received his blue belt and long-serving students Mateusz Grabiec, Dawid Loukil and Pawel Sczencia received purple belts. The second seminar of the month covered striking for MMA and was taken by coach James Doolan who runs Scotland’s most successful MMA gym and is home to UFC fighters Danny Hendry and Stevie Ray. This seminar broke down basic striking and movement with the emphasis of footwork and body position while striking. Both seminars were well attended with students learning from two of the country’s most knowledgeable and respected coaches. Anyone who would like to start BJJ or MMA are more than welcome to come along and try. First session is free! 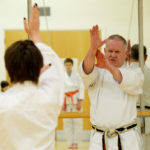 Kaishin Wado Kai at Dunbeg School is on a Tuesday from 6.30pm to 8.30pm. Knights of the Tower are still looking to boost their members, male and female, who are welcome to turn up and try out the sport of medieval combat. The club trains on Tuesday nights from 7pm until 9.30pm above Stoddart’s of Oban, in the Old Crofters. Come down to have a look at what we do and have a chat with some of the members or maybe even try it out.